The new boss arrived yesterday and she looks at least 20, maybe 25 years younger than you. She seems to be on her phone texting all the time and wait…did you just see her take a selfie in her new office? Don’t despair! Many older workers have successful, positive relationships with their younger bosses. Take a deep breath and rest easy. 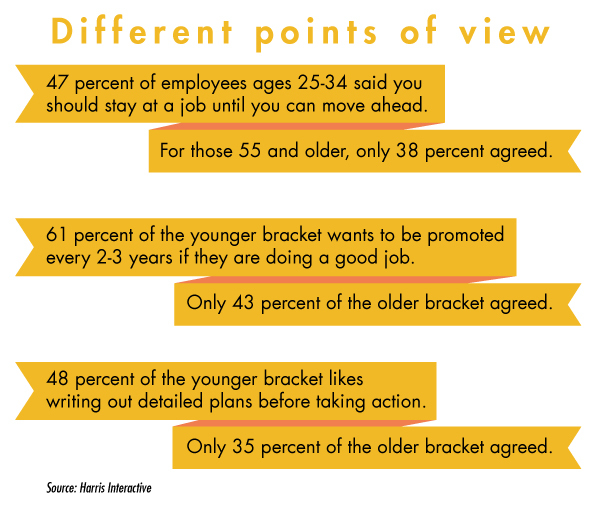 The employee-employer relationship doesn’t need to be a challenge if there’s a generation gap. Liz Meyer is a 56-year-old administrative professional at a Wisconsin insurance company. Erin, her supervisor, was the assistant of Meyer’s former boss. So when Erin, who is in her 30s, was promoted after a couple of years, the transition was smooth. Besides the fair treatment and open-door policy Erin offers her staff, she is also a skilled admin. Attitude is the key for Meyer. She said no matter the age difference, she maintains a business attitude. A former supervisor of hers called it “principles before personality.” When there’s a disagreement between her and Erin, they discuss it. Age differences should never come into the picture when there is conflict. If Meyer has a conflict with a coworker, Erin is her go-to person. Suzanne Benderski’s relationship with her boss Joy at a Syracuse, N.Y. staffing firm is so powerful, she has changed jobs just to keep working with her. They consider each other colleagues and friends, even though Benderski is about eight years older than Joy, and they lead two very different lives. She has great rapport with her coworkers, many who are decades younger. When issues arise, she remembers that young people have a different way of communicating. “You have to listen to what they say and less on how they say it,” Benderski said. “They Tweet and Facebook and deliver in sound bites.” When emails come to a conclusion, a younger person may not send a direct reply. “You have to not take personal offense to how things are delivered,” she said. “And that was a real adjustment for me. I’m used to long emails.” She added they have adapted to their different communication styles and she doesn’t feel subservient to Joy. She is Joy’s right hand and partner. J.T. O’Donnell, a career counselor and founder of Careerealism, said the biggest battle when dealing with clients who have issues with younger bosses is recognizing the problem. Communication and a change of perspective makes the difference between a positive working relationship and a negative one. O’Donnell finds it interesting that more young people don’t come to her with frustrations about older people in the workplace. She said they are used to being counseled and guided their entire lives. She said around age 40 employees know what they want, have worked hard to get where they are, and they don’t understand why young people seem entitled, lazy and just don’t “get it.” This causes a disconnect. “You’ve got to back up and try to remember what it was like to be in your 20s, and what experiences haven’t they had yet, and what their priorities are,” O’Donnell said. She added that the priorities of Boomers are much different than Millennials, who may not have homes or children to look after. She said young supervisors are more likely to desire interaction with their employees outside of work. Older employees should make an effort to embrace these kinds of differences. O’Donnell’s advice is to identify different traits or skill sets the supervisor has developed. She said to focus on things you can’t do as well. Is the younger supervisor excellent at using a certain technology you hate? Focus on that. She likened the work environment to a sports team. Players understand their positions well and recognize there’s no success without a team effort. I enjoyed reading this article, as it had interesting suggestions. The one thing I didn’t like was the fact it compared Boomers to Millennials – completely overlooking Generation X. Notice this excerpt…”She added that the priorities of Boomers are much different than Millennials, who may not have homes or children to look after.” I don’t know too many ‘Boomers’ that have children to look after, unless they are grandparents raising their grandchildren. She did, however, mention people in their 40’s once, though I think she lumps us in with the ‘Boomers’. This almost feels like Middle Child Syndrome all over again! Thanks for allowing the little vent.